School's out for summer, in my little world. Last week for kiddos, this week we teachers wrapped it up. In honor of that, I felt like it was the right time to share "The Great American Duck Rescue of 2017." You see... kids weren't our only patrons this spring. In addition to all the little cherubs that are left in our care and safe haven by their parents, we had some extra special trust placed in our hands. Trust from Mama Duck. Mama Duck is a frequent friend, who finds a home with us each year. For years, she has come to nest and set up shop in our courtyard--a completely enclosed, fox-free, kid-free, complication-free (& catered) environment. Not to mention, it becomes a peek-able, teachable moment for our students, watching the ducks grow in the spring, then fly off in the fall, right after we have returned back to school. We know it's the one and only Mama Duck as she has a little limp, which is part of her signature trademark. 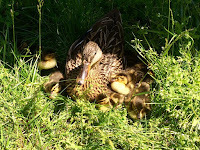 Here's a picture of Mama Duck and last year's crop of ducklings. This year, we may have even gotten to see some of the courtyard courtship with her and Papa Duck, and conveniently camera-captured it. I'm not exactly sure what Mama Duck was thinking this year, though. She managed to set up shop in a non-traditional spot. She must have been casing out the joint on a weekend, where it was kid-free and quiet. She decided to put her nest not only on our playground, but right outside one of the 5th grade doors--which believe me, is never a quiet location on a weekday! Being a school who embraces problem solving and the maker movement, the 5th graders, their teacher, and the janitorial staff put up some orange fencing as a temporary boundary to keep wayward PreK & Kindergartners out of the nesting area. Then a team of handy 5th graders and their fathers came to put up a more sturdy wood and wire "Fort Knox Fence." All was well in the newly-created coop, and baby ducklings ultimately hatched. About a dozen of them! They had a lovely first day, experiencing their world, where playground peeks could happen, and impromptu pools showed up. Mama Duck, what were you thinking? She had build her nest right under the bush beside the 5th grade door--but more importantly, next to a PVC drainage pipe. A broken one at that, with an open and exposed hole on the bush-side of the pipe that none of us had previously seen. Enter Duck Drama on Day 2 with that! 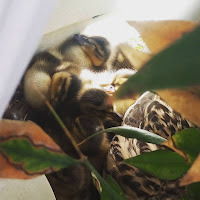 While the ducklings were all cozying up in their nest, about 7 of the dozen ducklings got a lesson in gravity and the fell right on in the side-hatch-hole-door, and down the pipe. Luckily, a few teachers noticed some of the ducks were missing then happened to hear the distant sound of baby ducks, peeping down the pipe. Operation Great American Duck Rescue began in earnest! 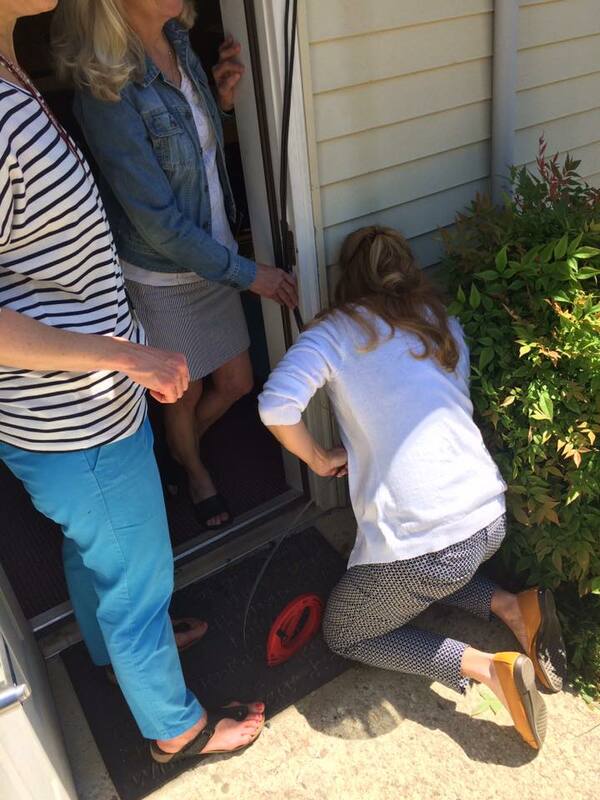 Duct Tape Tools & extensions were created that crouching teachers attempted to use to rescue the little fluffs. About 5 were retrieved via bending, stretching, reaching, and with some major arm scrapes along the way. But there was still the sound of tweets beneath. So then we all started surveying the territory. Where did this pipe lead to? We found the ultimate ending to where the drain would drain, down little hill on the far side of the playground. Problem solving minds started brainstorming. Ducks can swim; this is a drainpipe. What happens if we flush water down? The hose alone didn't create strong enough current, so then buckets of water were poured down. I happened to be one of the teachers with a student, down by the outflow area--where we decidedly heard the tweets as well. The water stream was building, and wait--it sounded like the tweets were getting louder! Yes! But wait? My 5th grade friend and I looked at each other--do you hear 2? We both could have sworn, yes indeed! It took far longer than we thought it would, but the stream kept flowing and the sounds of the ducklings sounded closer and closer. Please, let there be no grate to close them off from the exit! As other teachers were looking for flashlights or buckets to help with the rescue, there came a point I was by myself, sitting on the concrete block hoping and awaiting our feathery friend(s). The river of water kept flowing the right way, when voila! Out popped a duck. Rescue! But wait! Open land... a duckling... me! Must Capture Duck!! Well of course, the li'l fella was scared to death when I attempted to scoop him up, which he didn't really like all the man-handling and jumped right out of my hands...inches from the concrete block I'd just been sitting on. Li'l ducky, we haven't come this far to have death by concrete! As I'm jumping around trying to contain a little scaredy-duck, out pops a second feathery friend from the dark depths of the drainpipe....leaving me nervous I'd lose one or jump on the other. Luckily, our science teacher had perfect timing, with a 5 gallon bucket in hand--wondering what on earth I was doing jumping all over the place. She clearly had steadier hands than I, and swooped them up in the bucket. Ducks were all reunited with Mama, and we all breathed a little sigh of relief!! 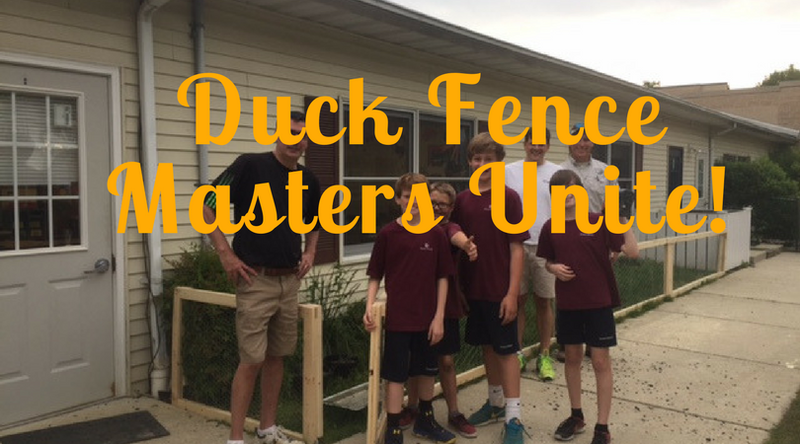 One of our Master Fence Builders happened to have one wayward duckling at home by the water, apparently abandoned by its mother... so that night, Operation Relocation took place. 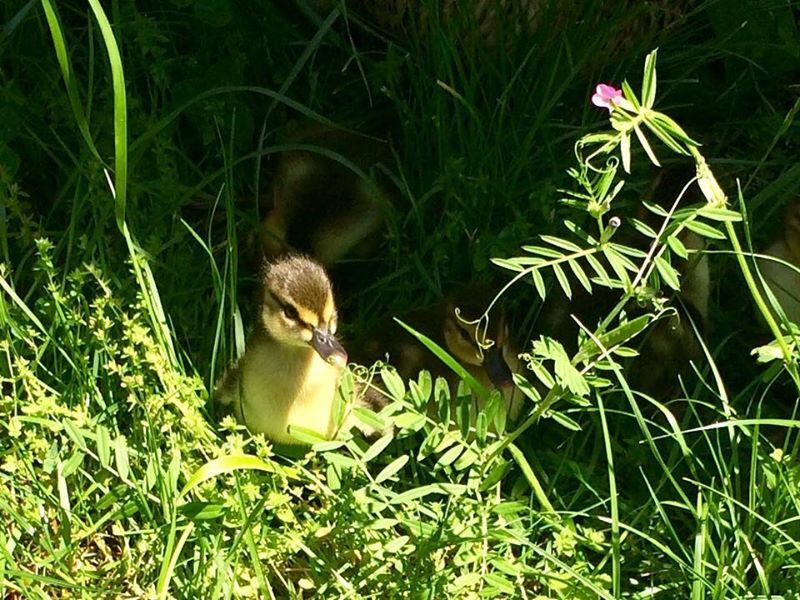 Our waterside family came to the school to gather up and relocate Mama Duck and her dozen ducklings to their house. 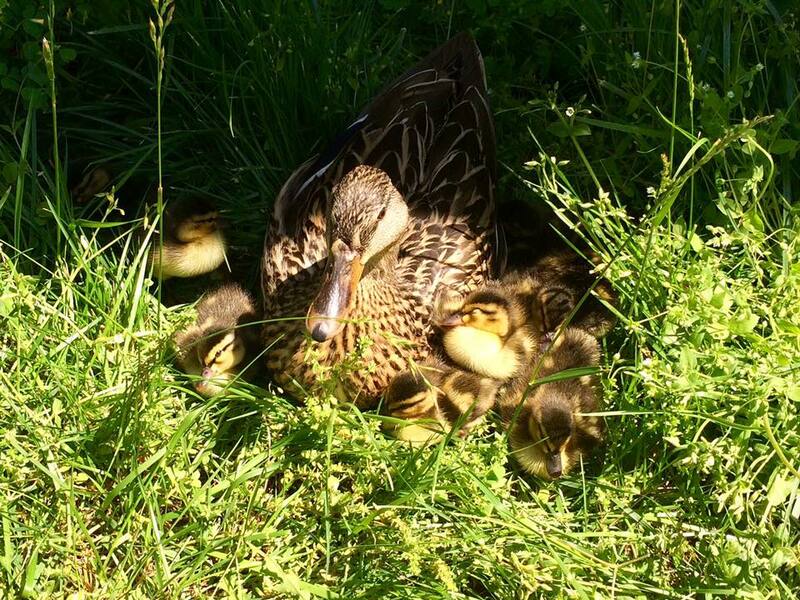 Mama Duck instantly adopted the little orphan, and have a new playground-free, waterside community to live in. Taking part in the whole event made me feel in touch with nature in a way that helps put it all in perspective. In this great big, complicated world, it's the little things that are important. Being of service to others is what matters. 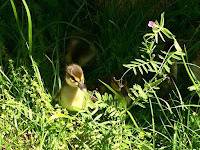 We saved 2 ducks, and really a family of feathery friends+ 1 orphan too. Yes. These are the important things, and I was grateful we all could help & be a part of something small, but bigger than us all. Pictures taken from either my camera or those of my colleagues. Word art added using Canva.com.